How Do You Handle Life’s Most Embarrassing Moments? 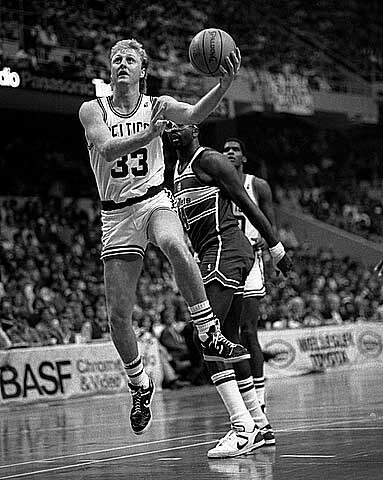 Wonder if Larry Legend every had an embarrassing basketball moment? My teammates and I are playing defense in the second quarter of our private school state championship basketball game. Suddenly a player from our team steals the ball. Noticing an opening, I move from my defensive position up the floor. In a split second, I find myself on the receiving end of a pass with nothing but hardwood and our basket in front of me. Pounding the ball into the floor, I streak forward, gaining speed with each step. All of their team’s defenders are trailing behind me as I hear the crowd’s cheering begin to swell. This is clearly leading to two points as an open lay-up awaits. How could this happen? I’m a senior…co-captain of the team…leading scorer…MVP. I’ve worked tirelessly for four years and pushed myself beyond reason for this type of moment. To win a state championship has been my dream, and now I’m clanking the ball off the backboard, blowing a gimme lay-up?! What the heck! Talk about one of my most embarrassing moments ever. I’d never experienced anything like that before on the court. I have been fortunate in the years since my gaffe to coach many high school basketball teams. I’ve witnessed other embarrassing moments along the way, from air balls to athletes stumbling over their own feet. Some embarrassing moments just leave a coach shaking his head. It’s hard not to laugh when a player on your team gets turned around, then confused and shoots the ball in the opponent’s basket. What I notice most about embarrassing moments is not that they occur, but what the reaction is of the player who commits it. What I love most is when an athlete reacts the way I did after my ill-fated shot attempt. 1. Anger. This emotion is an easy one to spot because it’s written all over the player’s face. Teeth clenched…eyes on fire…self-deprecating yelling. I’ve seen kids get so angry at themselves for doing something “stupid” that they can’t function anymore on the court. I have to pull them out of the game to let them simmer down. 2. Self-pity. Another obviously identifiable emotion, as athletes hang their head after embarrassing moments. They become ashamed, sluggish, and mope around the court for the next few minutes. They become a useless cog in the machine, wallowing in their self-absorbed unhappiness. Their destination also quickly becomes the bench. Step 1: Player makes a mistake. Step 2: Play continues with no obvious impact on the player. Step 3: Player begins to think about making another mistake. Step 4: Player begins to show signs of hesitancy, nervousness and lack of aggression. Step 5: Player is stifled by the prospects of another failure. They become intimidated by game situations and resist taking any risk (so as not to make another mistake). Step 6: Coach sees it and makes a substitution. What’s the best way to react to embarrassing moments? I always coached my players to respond the way I did after blowing that lay-up. Five seconds after I missed that shot it was a distant memory in my mind. I was back hustling on defense as though nothing had happened. In short, I forgot about it…quickly. It’s easy to get down and be ashamed for mistakes. If we let them, the emotions of anger, self-pity and fear will overwhelm us and damage our productivity. In succumbing to them, our true talents and abilities are masked, never reaching their full potential. These negative emotional responses represent enemies to our future success. You can’t change the fact that the moment happened. So why dwell on it? You will only make yourself feel bad and hinder forward progress. Furthermore, we have an ally in whom we can trust in emotionally tough situations. God does not judge us in the negative way we judge ourselves. Nor does He place his value on our lives based on one moment or a series of moments. When we feel those negative emotions building we can always look to Him for support. Get over it! Get your head back in the game! Refuse to let your enemies triumph over you! Oh…and just in case you are curious…my game turned out like this. Questions: What’s your natural reaction to embarrassing moments? Do you show anger, self-pity or fear? How do you move past embarrassing moments and mistakes? have A VERY SHORT MEMORY! free. If he chases a running quarterback he’ll get burned with a pass over his head. If he doesn’t give chase and covers the receiver, the QB will burn him for a long run. misstep and move on to the next play with determination and confidence. That’s the ticket…short memories. There is no place in the athletic arena to dwell on failures. It depends. Most of the time I probably feel self-conscious and embarrassed. But sometimes I can laugh it off too. I don’t think I ever get mad at myself for making goofs…however I do tend to get mad at myself for making dumb mistakes I know better to avoid. Recovering perfectionist. That sounds a lot like me. Embarrassment doesn’t get the best of me but the dumb mistakes, those are the ones that irritate me. If I’m not careful, I can let that eat at me for longer than I would like. I’m also one for self-deprecating humor, at least around those I’m close with. At work, it can range from being annoyed at myself for being so silly, to self-pity, but not to fear. I know I have to get back up and continue doing my job, I just need to be more careful next time. Lately, I’ve witnessed fear from a new coworker. Sadly, our boss likes to yell when we make mistakes, and it’s not constructive, so she’s been scared of attempting new tasks out of fear of doing something wrong, and getting yelled at. Not good! Too bad…yelling would shut me down as well. I’d have little tolerance to put up with that for long in a work environment. I have a tendency to revert to laughing at my self and using self-deprecating humor to cope with my embarrassment. Humor is a good resource to use. I love seeing people who can laugh at their mistakes. Keeps us humble.